Sad news: Freckles, the original Blonde Coyote – the inspiration for the name of this blog – is gone. I don’t know details about what happened. She was found in abdominal distress and the emergency vet determined she needed to be put down. She was 10 years old and full of life on our last hike together in April. I don’t want to think about the desert without that magnificent coy-dog glowing in the Sun. Freckles was a coyote hybrid, equal parts sweet and smart, shy and skittish. She wasn’t mine, but we hiked hundreds of miles together and she would have followed me to the ends of the Earth. Hiking with Freckles was an exercise in trust: she was stone cold deaf and entirely untrained. I couldn’t tell her what to do; she did what she did because she wanted to. Having her as an ally– being judged pack-leader worthy by a coyote – was one of the great honors of my life. We never get enough time with our dogs, but I find some solace in knowing that every time Freckles ran like a wild thing across the desert, I stopped to watch and every time the sun hit her in that way that made her shine, I stopped to look. In the three winters we spent together, we explored the desert just about every day and every time I wiggled my fingers at her – my greeting to the deaf dog – she flattened her silent ears and smiled. Coyote Smile- Freckles may be deaf but she’s a fluent communicator. There’s a reason why I named this blog after Freckles. I would not be the traveler I am now if I hadn’t followed that beautiful blonde coyote through the desert for all those miles. She taught me to wander freely, to look at everything, and to trust in my own dogs as intelligent, capable creatures. Most of all she taught me to follow my own instincts all the way to the horizons. I think of Freckles often in my travels and in that way she’ll always be with me. Take all your good dogs for a walk today in honor of Freckles. Here’s to the Blonde Coyote. Check out my previous dog posts: Hiking With Dogs, Finding D.O.G. and Dog, Memory. 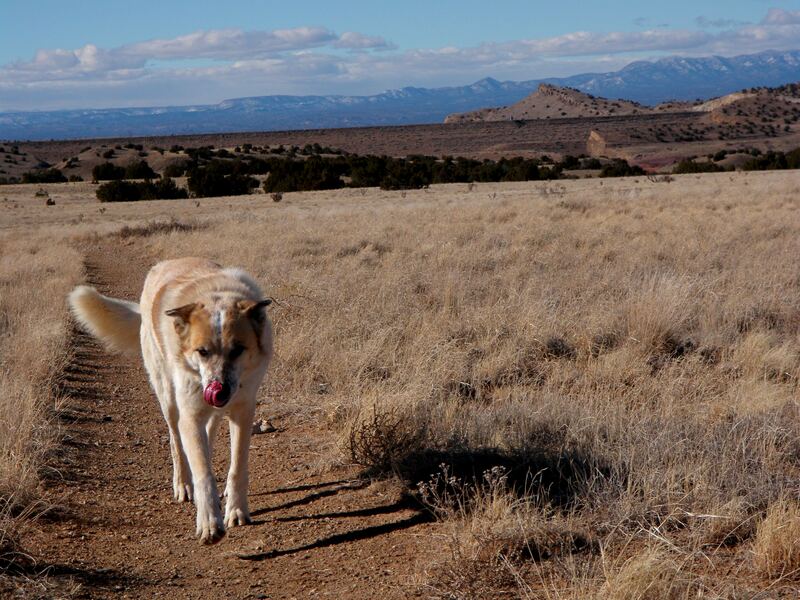 This entry was posted in Bowie & D.O.G., Hiking!, New Mexico, Photography, Uncategorized, Vagabonding 101 and tagged blonde coyote, coyote hybrid, dogs, hiking, New Mexico. Bookmark the permalink. How sad, and how beautiful hommage. I am so very, very sorry to read of Freckles’ death. After 14.5 years my beautiful Max died a few days before my birthday in February. When you say “abdominal distress” and nothing to be done, well, it sounds exactly like what happened to him. If Max had been younger he probably would’ve survived what is apparently routine emergency surgery, but as with Freckles it was determined there was nothing to be done. From your pictures and story, it’s easy to see that Freckles couldn’t have had any better life. A great loss to you as a travelling companion, but you are save in knowledge that she was always a free spirit and lived her whole life that way. She is a beautie….will miss her! May her spirit be alive in your soul forever!! Such sad news Mary but what beautiful memories you have of Blonde Coyote. I’m sure her spirit will still be with you on your travels. Your story made me weep she was a lovely dog. How sad. She was a beautiful coy-dog. My dog, Sadie is 15 and becoming more frail. I dread the day she can no longer have the life she deserves. My thoughts are with you and Freckles. So sorry your desert companion is gone. Your blog was sad but a wonderful memorial to your friend. I’m so sorry for your loss. Freckles was a beautiful dog. So sorry for your loss, hang in there. I was so deeply sorry to hear of your loss. I lost my beloved Logan over a year ago and even though he is gone physically from my life, he will always be with me in spirit just as Freckles will always be with you in the same way. What an amazing dog she was and what a beautiful friendship you both shared. What a beautiful tribute to her. I’m so sorry to read those news about Freckles. But it’s a wonderful hommage to a great friend. So sad that we jave to let go of our four-legged friends some time. It’s always way too soon, isn’t it? A beautiful creature Freckles, who will always be by your side or flying out in front guiding you to new adventures. You may not get to touch her fur, or look into those eyes again, but you will remember and that memory is alive. You will see her every now and again when the sun shines just so, or sitting on a rock waiting for you. If you believe and stay open you can feel her presence like a cool breeze when it’s hot, or a brush against your leg. My condolences to you on this physical loss. Im sure you will always have your heart warmed by this special one. To be picked by her was so special, you must be pretty special yourself to have understood her so well. Through you and your writings and photos the blond coyote will always be alive in our sprites and adventures. She was such a beauty with a free spirit, rest in peace girl. Thanks to this blog the Blond Coyote lives forever. She was beautful and lived a life any adventurous dog would envy. Lucky you who got to know her and be a packmate. She was a spirit put here to teach. jack and never will. The moments you have with such a dog( coyote) will live with you forever. That is a good thing. I am 66 years old and Jack is with me every day, I wouldn’t have any other way. Thank you for sharing your thoughts and photos.. I too got misty when I read the post. I saw this through nutsfortreasure. This is a simply beautiful tribute to Freckles. She has crossed the Rainbow Bridge with fond memories of a lady who understood her, loved her and acknowledged her. Thank you for this post, as a reminder to love the fur-babies in our lives, for they are without a doubt the most magnificent creatures. I am sorry for your loss- Jenny (Australia). Loved your tribute. Dogs are wonderful companions. Our own little wiener-lab mix LOVES hiking and recently did a 7 miler through steep forest trails and endless dunes without losing his smile. A lovely post in memory of Freckles. She will live on through you & your blog title. So sorry to hear about Freckles. Thank you Freckles. The walk with my two dogs this afternoon was in your memory. My heartfelt condolences. You were good for one another. I found a very cool rock today, brought it home and placed it on my dog’s grave – in memory of Freckles the Blonde Coyote and in honor of your doing her free spirit justice. Let Bowie and D.O.G. help soothe the pain. Sorry to hear about the Coyote passing on. There is a time for everything, so I’m told. Now we remember the good times. So, so sorry! It is never easy when one of our best friends pass, and to lose a legend is a double loss. Very sad, but I am sure you enriched Freckles life with your energy, companionship, and unquestioning love. A most beautiful tribute to a magnificent and sweet soul…. Here’s to her, and your, continued travels. So sorry for your loss! Thank you for sharing Freckles with us! And your wonderful travels! Be on the look out for another special creature to enter your life as it seems the universe will bring us those we need in times like these. I know she felt blessed to have had you in her life as well, as its obvious in your photos of her affection for you. RIP Freckles! So sorry to hear about Freckles. She will be missed and remembered by so many thanks to your special friendship with her and your stories about her here. This post followed by your Pow Wow post made me think of the amazing Native American stories that have been handed down for generations. I like to think of your posts about your Blonde Coyote as being a similar story, one that you have handed down to all of us through your blog where she can be remembered always. Thank you for sharing your special friend with us and I am so grateful that you both had each other in your lives. It is a Very Sad Day for Me to see that “The Blonde Coyote” has gone to Dog Heaven! My own Weimaraner is there also, so I can relate, even though You were not the owner, but a Friend to this Beautiful Coyote is how I think You said it? A Very Dear Childhood Friend has also gone to be with the Lord I just heard. So I guess I will find out about another here soon as they say “Comes In 3s”? Take Care, and “keep on truckin” safely! Sad… but beautiful inspiring memories live forever! Oh My goodness I have only just found your blog and was really excited to read about you both and found this post. Im so sorry youve lost such an amazing companion, she will be missed by the world too, your photos are gorgeous. We too have a wolf hybrid who is 10 years old and not long for this world and know what your feeling. I will be continuing to read about you as Ive just found you, love your writing and cant wait for more. There maybe another Freckles that needs a companion to travel with round your next corner, not that she will ever be replaced…how could she.